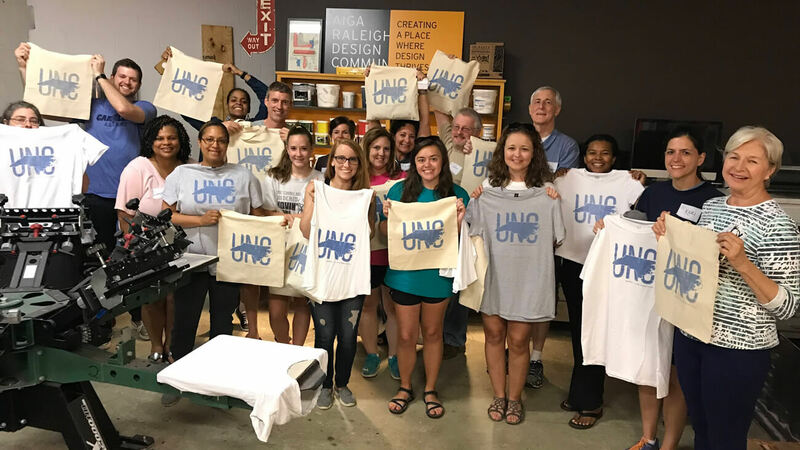 I was so happy to have the UNC Alumni Association come out and spend a Saturday afternoon with me. Everyone of them was excited and absolutely into every step of the process. I broke from my usual form and mixed Carolina Blue ink (PMS 542U) right there on the spot and everyone was surprised how muh actial Carolina Blue differed from the Carolina Blue we see in our heads. It's not the sky blue that everyone pictures but a much deeper hue. This was just another small way I was able to customize the experience for the UNC Alumni Association. If you want to hold a team-build event here let's talk about how we can make it custom for you as well!